As we’ve noted in this space before, “EMV” is coming — sooner rather than later — to America. It’s that standard — already adopted in Europe and Asia — of having an additional chip on your charge card, as well as an additional means of authenticating any charges made in person, like use of a PIN or a signature. “EMV” stands for “Europay, Mastercard and Visa,” and we’re just back from brief travel in the “Europay” zone — specifically to Germany. This was our first time in Europe since we’ve been reporting on EMVs here, and we were curious to see the differences in how our non-chipped “traditional” American charge card would fare vs. the recently upgraded EMV-ready card we had from another account. The surprise answer — at least during our week in Berlin — was that we rarely used the charge card at all. Cash, in this case Euros, turns out to be, if not king, at least much more widely used — at least based on our anecdotal experiences –than plastic. Or rather, use of plastic was more limited than we’re used to in the U.S. Yes, you could use it to charge your ticket when riding the Underground, but you also need your PIN to make the charge card work in those platform vending machines. We were also asked for a PIN in a European airport when transferring planes, and paying for our fish-and-chips. When we said we didn’t have one (this was for our no-chip card), the server went ahead and processed the payment anyway. Conversely, at the market across the street from where we were staying in Berlin, we’d visit often for fresh bread, croissants, and cheese (heck, wouldn’t you?). Each of these was about a third of what they’d cost in the U.S. for food of similar quality. And while the market — part of a large chain of mid-sized stores — would take certain cards for purchases, you couldn’t get any cash back, unless your purchase met a certain threshold. That also meant fewer ATMs, especially in neighborhoods without many bank branches. So in our congenial neighborhood with the cheap/wonderful croissants, there was but one close ATM — a few blocks down, at the aforementioned Underground station. This meant there would almost always be queues, day or night, of people waiting to get some tangible Euros in their pocket. It’s that last comment that may contain the tea leaves of future payments in the EU. 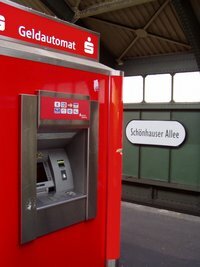 Since the “card” infrastructure isn’t as developed — at least in the “off-line” world of smaller stores, restaurants, and vendors — as it is in the US., there may be a leapfrogging into expanded mobile and e-wallet options, for all those people who can’t easily get to their local ATM to load up on Euros. Phones, more than plastic, may be more critical for packing, if you want to keep all your payment options on the table when in Europe. Though our ATM cards, as it turned out, were quite handy indeed, for getting cash. We used them far more often, in that capacity, in a week’s time, than we would back in the U.S. Meanwhile, whether you want your business to be friendly to U.S. cardholders, or to shoppers worldwide, if you’re an online merchant, contact your AVPS Rep about expanded payment options, including mobile, and make sure you’re ready for our own EMV “switchover” this fall. And if you expand your business into selling fresh-baked croissants for 50 cents each morning, please do let us know.